I would think that Nun’s Cross, or to give its correct name, Siward’s Cross must be about the best known of Dartmoor’s granite crosses. It can be classified as a ‘wayside cross’ as it marks the old monastic Maltern Way amongst other things. It is certainly the largest of the wayside crosses of Dartmoor and more than likely the oldest – see ill.11 here. Siward’s Cross appears in the perambulation of 1240, here it is stated, “… et sic linealiter usque at crucem Sywardi …”, the 1609 perambulation notes, “from thence linyallie to Seaward’s Cross“. Therefore it can be deduced that a cross has existed from at least 1240 and has been known by various spellings as Siward’s Cross. There is an inscription on the eastern face of the cross, between the arms, which stated, “Syward”, or “Siward”. 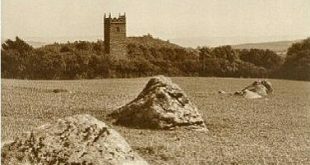 Which brings me to another point, when I published my Dartmoor Crosses book, one certain ‘reviewer’, Greeves, 1997, p.36, stated the following, “The usual error is repeated about the spelling on the east side of Nun’s Cross – it should be ‘Syward’ which is still quite clearly legible“. In 1892, William Crossing,1987, p.75, noted that, “I think there is unquestionably the word Syward or Siward. It is uncertain whether the second letter is a Y or an I“. Sometime during the same year, Chudleigh, 1987, p.85, writes, “The name on the eastern face is supposed to be Siward or Syward…”. Starkey, 1989, p.25, states that, “On the eastern face, across the arms the word SIWARD appears…”. Brewer, 2002, p.33 considers, “The cross has the word, ‘Syward‘ or possibly ‘Siward‘ on its eastern side between the arms…”. I would suggest that if the wording was illegible in the late 1800’s, unless it was re-cut (of which there is no record) it can hardly be, “still quite clearly legible”, in the 1990’s as Crossing, Chudleigh, Starkey, and Brewer concur! Let the mighty ‘Google’ be the decider, put in an exact term search for ‘Siward’s Cross’ and you will get thirty eight hits, ‘Syward’s Cross’ returns just two – “The computer says, noh.. cough !”. Sadly, nature has hidden the answer as the lichens and moss have virtually covered over both faces thus effectively obliterating the inscriptions as can be seen below. So, Siward, Siward, who on earth was Siward? He has possibly been identified as Siward the Earl of Northumberland who as Williams, Harper-Bill et al, 2003, p.8, suggests took the title after the murder of Earl Eadulf of Banburgh in 1041. He first appears in the Anglo Saxon Chronicle in 1043 when he rode with the newly consecrated King Edward from Gloucester to Winchester, Swanton, 2003, p.163. In 1054 the Chronicles state that Siward went to Scotland with a, “great raiding army”, and “put flight to King Macbeth”, Swanson, p.184/5. The death of Siward was recorded in 1055 where he died at York, his body was buried at Galmanho, which although the site is now lost was thought to be near Bootham Bar, Swanton, p. 184. Stenton, 1986, p.417, describes him as not being, “a statesman, but a Danish warrior of a primitive type…”. John, Campbell, 1982, p. 209, gives a bit more of Siward’s background when he says that, “We know nothing of his antecedents but he was closely connected with a powerful local family that had provided a number of earls of Northumbria from the tenth century onwards. Siward married the grand-daughter of the Earl Uthred”. Veering completely away from the subject of the cross, I can thoroughly recommend reading the latest Bernard Cornwell trilogy, ‘Lords of the North’ which is based on Earl Uthred, much of the story takes place in Wessex. One might ask why an Earl of Northumberland should have his name inscribed on a cross in Devon? It is known that Earl Siward was witness to the signing of Exeter’s founding charter in 1050 and that he was Lord of the Manor at Tavei, Brewer, p. 33, sometime between 1042 and 1055. The only fly in the ointment is that as Brewer, p.33 notes, there is some question as to whether Siward’s lands extended as far as the site of the cross. So there the mystery lies, it would be nice to attribute the inscription to Siward, the Earl of Northumberland but it can’t be proven. Another inscription on the western face reads, “BocLonD”, time has certainly taken its toll on the clarity of the words as a comparison between an early photograph, and the one of 2006 -see above. As place-names go, Boclond translates as ‘Bookland’ and refers to any lands held by charter, Ekwall, 1980, p.72. In this case the charter is probably that of Buckland (Boclond) Abbey which was a Cistercian house founded in 1278 by Amicia, Countess of Devon. This then causes another problem, if the cross was mentioned in the 1240 perambulation this would date it to before the founding of Buckland abbey in which case was the ‘BocLonD’ inscription added at later date? In Brewer’s, p.33, opinion it is possible that the cross was erected as a waymarker for monks travelling between the abbeys of Tavistock and Buckfast. This would then provide another range of dates as Tavistock was founded in AD960 and Buckfast in around AD760 and then refounded in 1018. So working on the fact that the cross was a monastic waymarker, there seems very little point in having such a thing unless there were two monasteries to link with a track. Therefore the last monastery to be initially founded was Tavistock in AD960 this I would suggest was the earliest possible date for the cross. On the other hand, if the track linked the Tavistock Abbey with the refounded Abbey at Buckfast it would give a date of 1018. Both dates would put the cross in-situ for the, “Siward” inscription dating between him becoming Earl in 1041 and his death in 1055 and the much later, “BocLonD’ wording which may go back to 1278. It would have also been standing in 1240 for the perambulation which leads to my personal theory, namely, at the time of the 1240 perambulation the cross had been inscribed with the word, “Siward”. The word, “BocLonD” was carved at a later date because if this wasn’t the case why was the cross so definitely named, “Crucem Sywardi”? Then we come to the next mystery, that of the crosses other name, “Nun’s Cross”. Gover et all, 1992, p.196, suggest that the first mention of, Nannecross“, was in 1699, “Seaward’s Crosse”, was still being used in 1608. Interestingly the Place-Name Society can give no explanation as to the roots of the entry. Crossing, p.78, does venture a suggestion and that is the word is derived from the Cornu-Celtic word, nans, which means ‘a valley, dale, or ravine’. There are two problems with this idea, firstly, although the cross does sit in a small depression it could hardly be described as a valley let alone a ravine. Secondly, if the earliest mention of the place-name was 1699 why on earth would they want to be using the old Celtic language? The cross also has marked the bounds of the early Brent Moor bounds as well as the Walkhampton parish limits. The Abbott’s Way also uses the cross as a waymarker as does the other monastic track, the Monk’s Path which makes it a busy junction of trans-moor tracks, especially today. An aerial photograph clearly shows the eroded tracks that converge on the site of the cross – see above. One of the earliest maps of Dartmoor is one from the 16th century which depicts the bounds of the Forest of Dartmoor – see above. On it is marked, “Crux Sywardi’, it has been suggested that this map could relate to another perambulation of 1556 – 57 whose bounds are identical to that of 1240. There seems to be a modicum of artistic licence on this map as the cross is depicted standing on a plinth. It could be said that the actual cross depicted has a striking resemblance to the nearby Childe’s Tomb cross? Amazingly enough the cross is not marked on the 1765 map drawn by Benjamin Donn. The OS however were taking no chances because in 1888 they call the cross both Nun’s and Syward’s. They also clearly indicate the fact that their surveyors has visited the cross and left a calling card in the form of an incised bench mark. Within the area are Nun’s Cross Brook, Nun’s Cross Common, Nun’s Cross Farm, Nun’s Cross Ford, Nun’s Cross Ford Mill, Nun’s Cross Hill, Nun’s Cross Mine, Nun’s Cross Mire, and Nun’s Cross Warren, all taking their name from the old cross. As can be seen, the cross now sports two iron clamps – see above. these were used in order to restore the shaft which was found smashed in two pieces. The cross’s saviour was a stone mason called John Newcombe who at the behest of Sir Ralph Lopes carried out the repairs sometime between 1846 and 1848. Crossing, p.74, notes how in 1846 two young lads were out on the moor looking for their cattle when they came upon the cross. For some reason they decided to rock the cross which resulted in it tipping over and the shaft breaking in two. In his book, ‘The Miser’s Money, Eden Phillpotts mentions Nun’s Cross: “The Christian symbol also occurs, roughly wrought in granite on wild heaths and lonely hills, to mark some place held sacred, to indicate an ancient path, or guide the wayfaring monk of old on his bleak journey by the Abbot’s Way. Of these, the most notable relic is Siward’s Cross, or Nun’s Cross, by which the more familiar name the moormen know it. Once the memorial was thrown down and broken; but bygone antiquaries set it up again and clamped the pieces together with iron. It now stands seven feet high, with stumpy arms and weathered front, whereon to the time-worn granite cling lichens grey and gold“. Today the cross stands at 2.07m and has an arm-span of 76cm, the circumference of the shaft is 1.46m and it is aligned in a north/south direction, Sandles, 1997, p.74. As with most features of the Dartmoor landscape, Nun’s Cross has been the subject of numerous letterbox stamps along with the associated farm and mine. Many were sited in the gully behind the cross and the banks on the edge of the mire – see above.. Brewer, D. 2002 Dartmoor Boundary Markers, Halsgrove Publishing, Tiverton. Campbell, J. (Ed) 1982 The Anglo Saxons, Penguin Books, London. Chudleigh, J. 1987 An Exploration of Dartmoor’s Antiquities, Pegg Pub. Pembury. Ekwall, E. 1980, The Concise Oxford Dictionary of Place-names, Oxford University Press, Oxford. Greeves, T. 1997 Book Reviews, The Dartmoor Magazine, No. 48, Quay Pub. Brixham. Harper-Bill, C. & Houts, (Eds) 2003 The Anglo-Norman World, Boydell Press, Woodbridge. Starkey, F. H. 1989 Dartmoor Crosses, Starkey, Exeter. Stenton, Sir, F. 1986 Anglo Saxon England, Oxford University Press, Oxford. Swanton, M. 2003 The Anglo Saxon Chronicles, Phoenix Press, London. Can you offer any explanation as to why, on some old OS Maps, there is BS marked at Nuns Cross (1887-1906) then BS’s (1954-1968) and only the Cross on 1981 maps. Do you know if there was ever a PCWW stone close to the Cross, which has since been removed? Or was there a Forest of Dartmoor stone there? Your help is appreciated as no-one can explain the BS’s! Pre-1954 OS maps show the cross at Siward’s Cross, along with the Ordnance Survey Bench Mark, and a separate BS to the east. This BS is shown against a wall and at a totally logical point at a change in direction in the boundary This BS and others along the boundary lines, have to be for the Forest of Dartmoor. The 1954 and 1968 OS maps both show BSs indicating another BS had been added. These same maps continue to show the parish stones but with the PCWW stones having been added. Logically the the second BS at Siward’s Cross has to be a PCWW stone. It has been erected at the change in direction of the boundary and without it the PCWW boundary would miss Siward’s Cross by linking the stones to the NNW and SWW of the cross. A map found at the Plymouth and West Devon Record Office, and dated 1916, indicates that it was proposed to erect a PCWW stone in the position indicated by the BSs on the later maps. While discrepancies have been found with this map it is totally reasonable to expect a stone to have been erected at this location and this is confirmed by the OS maps. The 1981 OS map attempts to differentiate between parish stones which it shows as BS, and PCWW stones, shown as stone, but the stones at Siward#s Cross are missing. A quick up-date on the comment I left a little earlier. I have now located photographs which confirm that there was a PCWW 1917 stone at Siward’s Cross.